These little Homemade Peppermint Pattie Candies are really easy to make and require only a few ingredients. If you are looking for a nice little candy to give your guest or adorn your holiday table, this is it. This recipe is being shared as part of the Ultimate Virtual Cookie & Goodies Party And Giveaway where you can find hundreds of Cookies, Candy, Cakes and holiday beverage recipes and more! Don’t they make a pretty addition to your holiday table? I found this recipe in one of those cookbooks you find at the grocery store during the holiday season. Sometimes they are really loaded with wonderful recipes. This book is from 2000. 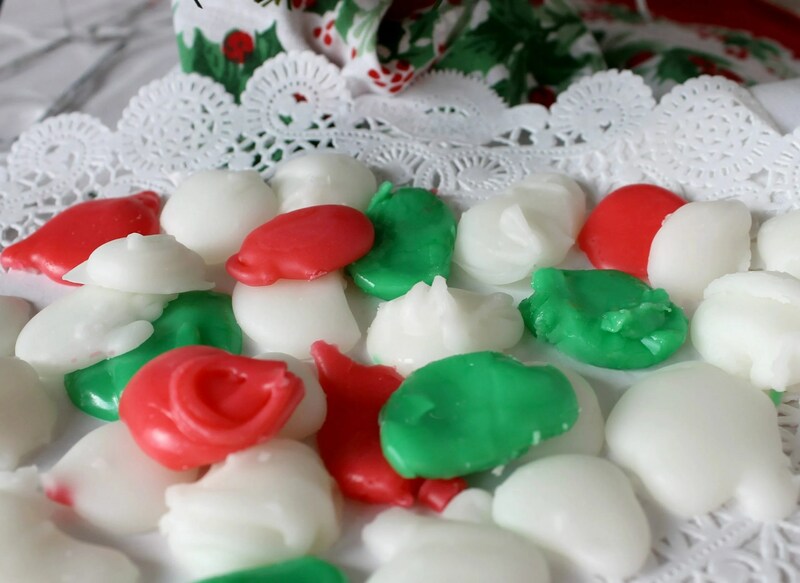 I have been making this Peppermint Candy for my family all these years. I hope your family will enjoy it also. Line several sheet pans with waxed paper. In a medium saucepan, combine sugar, water and corn syrup. Cook over low heat until sugar dissolves and mixture is smooth, stirring frequently. Remove saucepan from heat and stir in extract. If using food coloring, separate into bowls and tint each bowl with desired color. Be sure to use tall bowls so that you can sit each bowl into another bowl containing hot water. The hot water bath will keep the candy workable. I keep hot water in a tea kettle to use throughout this process. Be careful NOT to get the hot water in your candy mixture. Drop mixture by teaspoon onto waxed paper forming small patties. Let stand 24 hours or until firm. Can be stored in airtight containers. I store them in the refrigerator because we like the cold candy but refrigeration is not required. What is your favorite homemade Candy recipe? Thanks for hosting your fun Pinterest party! Those are the best! Thanks for stopping by. These look DELICIOUS Shirley!! I bet my husband would love these. He loves all things peppermint, lol. Thanks for sharing! These look so yummy!! We love making homemade truffles or bark. These are so pretty, and they remind me of something that my grandmother always made. She never shared the recipe, so I have no idea if this will be the exact same…that won’t stop me from trying it out on my family soon. Thanks for sharing! 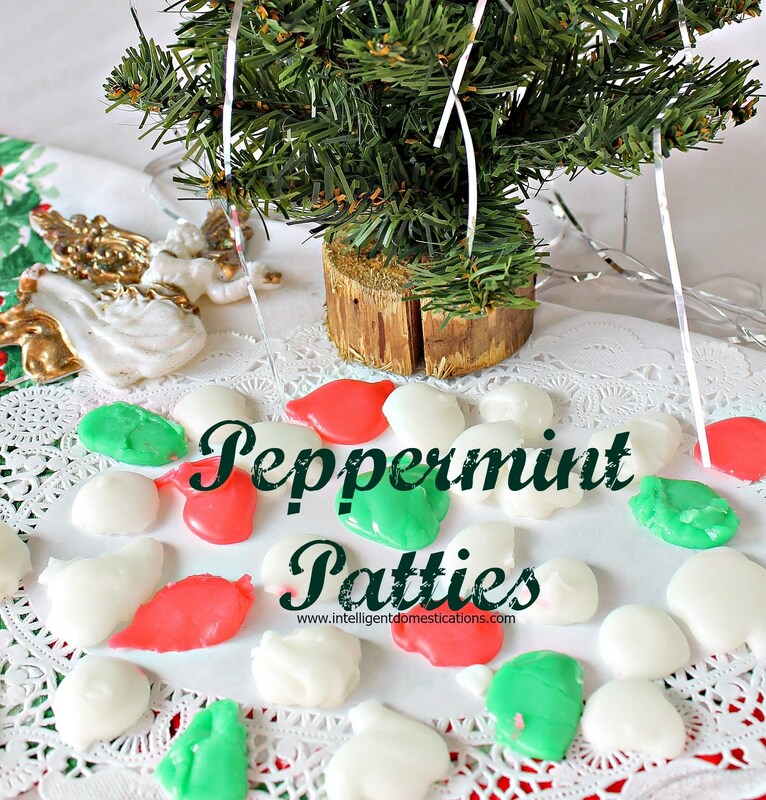 I love all things peppermint, and I really love the colors of these peppermints! They really pop! Those look great Shirley! I love all things peppermint..Earlier today, I created a peppermint recipe which I want to share sometime. Just not real motivated to type the post now. How fun and it would make a great project with kids, too. What beautiful peppermint patties! They look so festive and I bet they are delicious! What a great addition to the Christmas table. I would like one right now! This looks yummy! I love peppermint patties! With tons of holiday parties right around the corner, this is the perfect treat for those times. Everyone loves to snack on candies around the holidays. These look fun and simple. I will love to have these on my table.